"Karikaturen / caricatures" Collection. 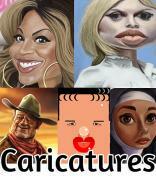 (Stars & famous people / Promis) Wow, we got over 4500 caricatures. Wonderful. Keep them coming!